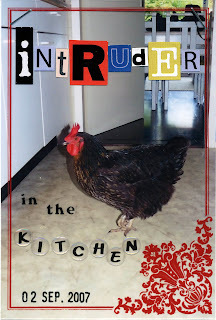 SCRAP-LOVE: Intruder in the kitchen. I made my daily something about my chicken yet again. Today she almost walked into the livingroom, she was already on the threshold when I came into the room. 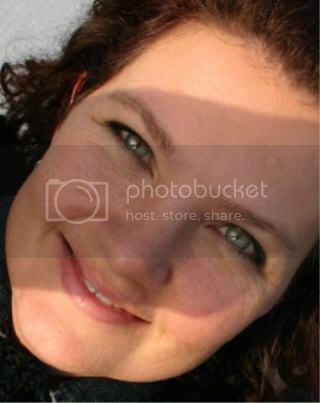 I used a transparant overlay of My Mind's Eye, called Tres Bien "Summer" Frame. The large letterstickers are from Making Memories. I'm still feeling tired and I have a lot of pain in my lower back. I went to bed in the afternoon to rest and made another crochet flower. I have made 8 thusfar. Hope I'll feel better tomorrow. Heehee, that is so funny! Hope you feel better real soon! hihi die kip toch! ik zal je wat energie toesturen en hoop dat je rugpijn gauw over is.